Paris—starting in the dark underside | Where to next? If you follow this blog, you’ll know that we usually travel to far-flung places. But for this couple of months we’ve made an exception—we’re visiting Libby and Daniel, the daughter and son-in-law who got married in February and moved to France in March, while we were in India. You can read about that here. We arrived in Paris four days before Libby and Daniel returned from a two-week hiking holiday in the Alps, but we weren’t concerned. We know how to keep ourselves busy, plus we chose to arrive early on purpose so we could recover from jetlag before joining a bike–barge tour in the Loire Valley (more about that soon). So after we collected keys to their flat, washed off the grime from two long flights and changed into fresh clothes, we headed out to explore some of the places Libby recommended on the lists and maps left for us on her kitchen table. 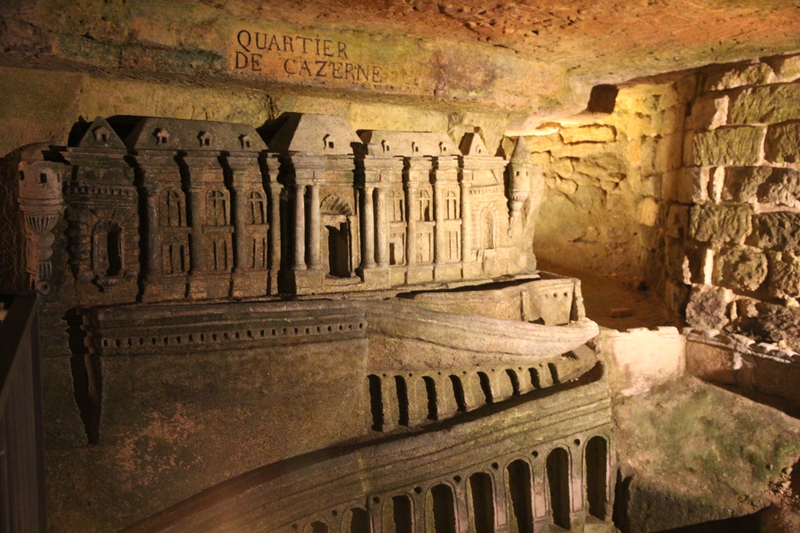 While Paris is often referred to as the City of Light, we decided to start with its alter-ego—its dark underside—the catacombs. It was a convenient choice and a place that Poor John and I had never before visited. Lib’s note said the entrance was a short walk from their place and that the tour would take about three hours, including queuing (standing in line). We figured that our arrival in the queue at 1:30pm was just about perfect. Little did we know that the catacombs close for a couple of hours at lunchtime, so we were standing in a queue that wasn’t going to move for at least 30 minutes. Luckily it was sunny and warm—a nice change from the wintry days we’d left behind in Australia. There was plenty of people-watching, and it gave us of time to study the guidebook we’d brought. So what about the catacombs? Let’s start with the miles and miles of tunnels that snake beneath the streets of Paris. 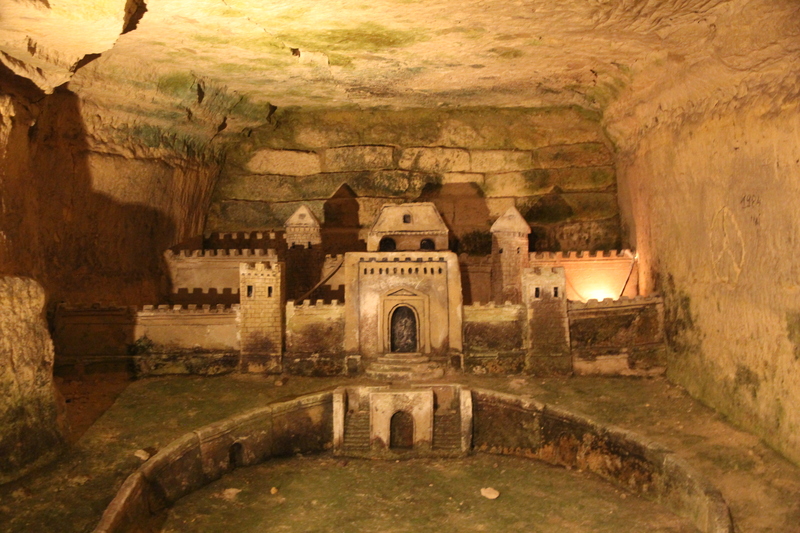 Much of the city is built from limestone and, starting in the 13th century, much of that rock was quarried in Paris itself, leaving a vast network of empty tunnels. These tunnels were forgotten about until the mid-18th century, when some of them caved-in causing widespread panic among the people of Paris. This mayhem was further aggravated by the fact that construction and collapsing continued throughout the city, often disturbing the graves of those ‘resting in peace’ in the many cemeteries scattered across the city. The residents of The Halles neighbourhood were the first to complain about the smell of rotting flesh. Even the perfume stores said they couldn’t compete with the stench. In 1763, Louis XV banned burials in the city, but the churches took no notice and the problem festered, literally. Fourteen years later, King Louis XVI created a government department tasked with preventing underground risks and monitoring and shoring up the tunnels to ensure the safety of property and people. Exploratory tunnels were dug under the streets. Some parts were filled in and other were reinforced with thick support walls and pillars. Finally in 1786 they began to shift skeletons from cemeteries to the vacant and reinforced tunnels. It took 12 years to move all the bones from 150 monastery, church and convent graveyards. It is estimated that six to seven million skeleton parts now lie in the catacombs. 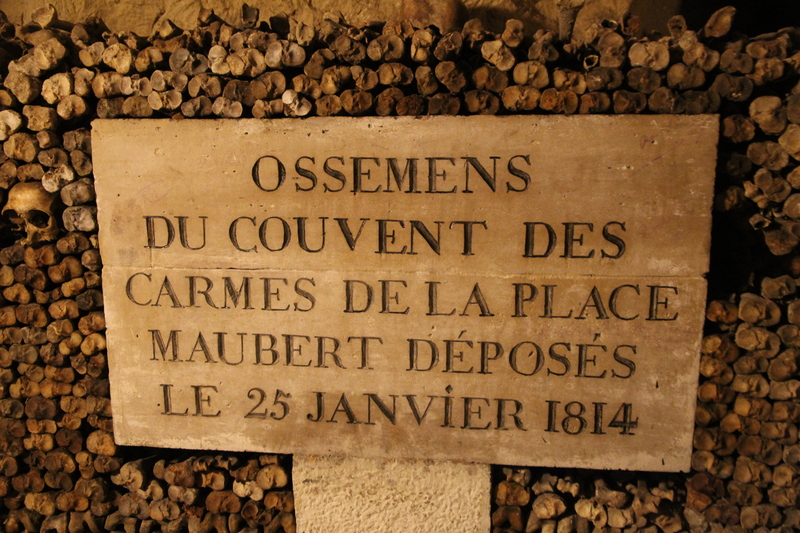 During the French Revolution and until 1859, the dead were often buried directly into the catacombs ossuaries. Two of the famous/infamous characters from history who call the catacombs their final resting place are Jean-Paul Marat, one of the Revolution’s most radical voices, and Maximilien de Robespierre, an influential figure during the Revolution and the subsequent Reign of Terror. While we didn’t see the resting place for either of these historical figures, we saw thousands of others. Bones are grouped by the cemetery they came from and the date they were moved. About a mile’s worth of bones are currently open to the public. These are neatly, and often artistically, arranged with skulls and leg and arm bones being used to create walls behind which, we assumed, are the remaining smaller bones. We also saw the handiwork of Décure, an ancient quarry inspector. HIs subterranean sculptures were made long before the tunnels became a gigantic graveyard. They depict the Port-Mahon fortress in the main city of Minorca in the Balearic Islands. Décure sculpted the models from memory after being held prisoner there by the English during the Seven Years War. Décure was later killed by a cave-in while he was trying to dig an access stairway way to the tunnels. It took us about 45 minutes to wander through the catacombs, so with the two hours we stood in the queue, the prediction of needing three hours was just about right. That said, we noticed the queue was quite short about 2:30pm—at least half the length from when we joined and hour earlier. Oh, and Libby and Daniel are pretty sure some of the catacombs run under their flat. Here’s hoping they don’t fall through. And if you need a refreshing drink after this subterranean visit, try the limoncello cocktail that Libby and Daniel made for my cooking blog. How absolutely amazing. So different from the bones you can see in Cambodia. Yep, very different compared to Cambodia. Thank you, enjoyed the write-up. I have never seen this. I remember when you 1st posted that you would be going to Paris. The time has just sped by. Happy times. Thanks Jeanette. It’s going to be a whirlwind—home in October. I first visited catacombs in Rome when my children were small. After 10 minutes of an english speaking guide an American woman said loudly ” You mean there are bodies in here?”. To which my son aged 8 said just as loudly “Of course”. I had forgotten they exist in other cities, I recall a visit to the tunnels under Luxembourg. Oh what a classic comment from your son. I’ll be laughing all day. No ‘body’ tried to channel me in the catacombs, but it is a rather creepy place to visit. Absolutely fascinating Peggy. I’ve been to Paris more than once in the 1970s and I never knew a thing about the underground catacombs. Just goes to show what some of the guides and guidebooks were missing around that time of my travels. Thanks for sharing all the interesting facts too. Once again, I’m really enjoying my armchair travel through your eyes. My pleasure, Vicki. I hadn’t known about the catacombs either, and have been here several times in the last 15 years (and in the 1970s). 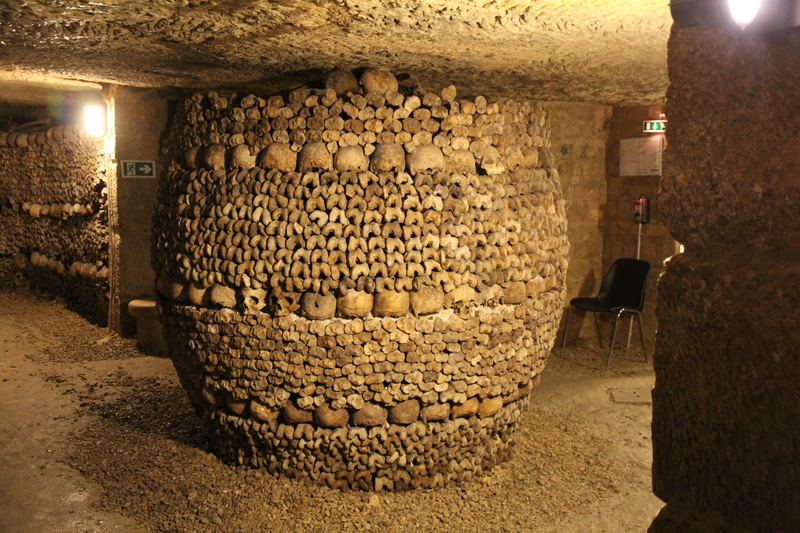 I knew a great deal about the catacombs in Rome but had no idea about the ones in Paris until your post. How fascinating! Thank you for another great tour of a place I may never see in person. I hadn’t know about them either. I guess we’re lucky Libby and Daniel live so close. It’s not as creepy as you think, but I wouldn’t want to live there either. Have been to Paris more than once but don’t remember hearing of those tunnels of bones! I hadn’t heard of them until Libby suggested we go see them. Fascinating! Can’t wait to see for myself! Oh, let me know what you think. 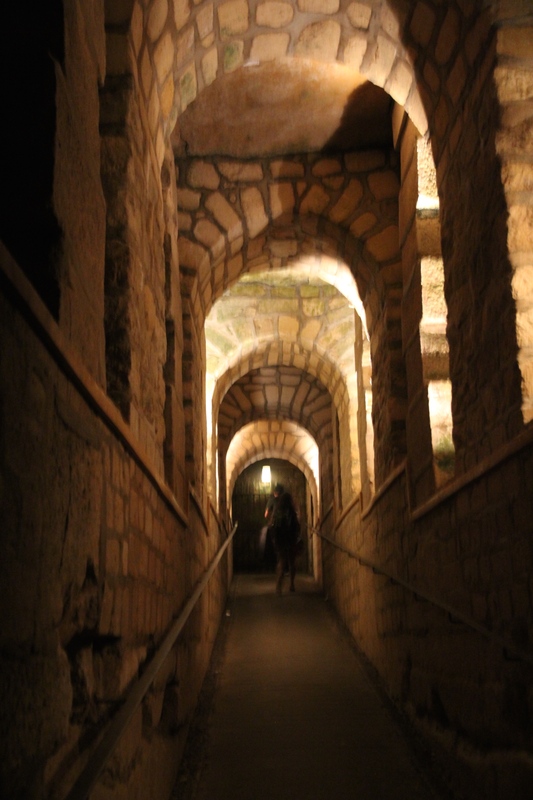 If you’re into the Dark Side of Paris and things a little off the beaten track, may I suggest a visit to the Sewer Museum of Paris – Les Egouts de Paris – sounds much nicer in French. If you can put aside the usual preconceptions, you might find it a fascinating visit. It’s actually a discovery of how a massive city has managed to provide water and sanitation to its populace for centuries, from Roman times to today. It’s one of the highlights of my trips to Paris. Have been recommending it for many years to all and sundry I know who visit Paris, and not once has someone gone. They have school excursions there – just like visiting Parliament House here I guess! Wow, thanks for a great recommendation. Libby says it’s been on her to-do list. Correction: It’s Le Musee des Egouts de Paris. No bones about it! – fascinating post. The way the bones are stacked are works of art. You are such a good writer and photographer and I really enjoy your glimpse of this incredible world. I have read about underground Paris a bit, and your words plus the pics brought it to life for me. Thanks Peggy! 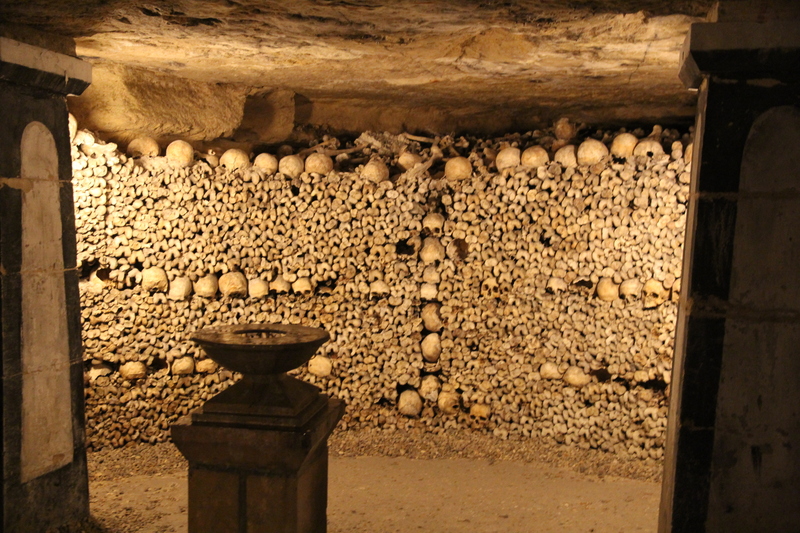 I’ve been to Paris and knew about the catacombs but didn’t have the time to see them. When I return to Paris, it will be on the list. Thank you for the fantastic pictures. A quick warning—they are closed on Mondays. All of that’s under Paris? I’d no idea. Yes, and there’s miles and miles of it. I was surprised too. Wow! Well, it’s just one more thing to add to my very long list of reasons why I want to go to Paris someday. Hope you get there soon. Nice write up and pictures, thanks Peggy. 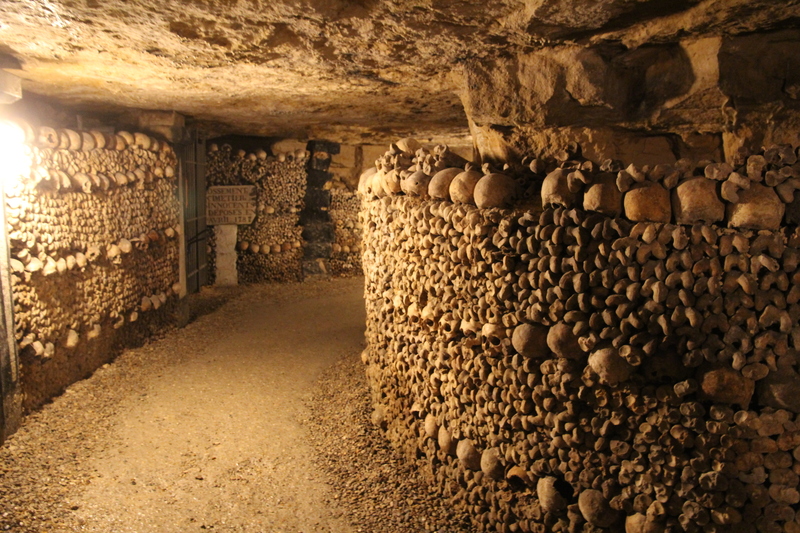 We are going to be in Paris in a couple of weeks & I’m trying to decide if I am up to trying the catacombs – claustrophobia. Just how narrow and squeezy is it? The most claustrophobic aspect is the fairly narrow spiral staircase to get in and out, at the beginning and the end of the tour. Otherwise the tunnels are wider than your arm span and much higher than your head. The path in the second pic (above) is about two metres wide. Hope that helps. Engaging history. Beautiful golden photographs. Altogether nice job, Peggy. Bravo! Thanks so much. It is such an interesting place. Something I’ve always meant to do and in Rome, but never have. Did you visit any of the church basements in Lima? Can’t remember if we visited any church basements in Lima. My pictures will remind me when I get home. It is hard not to comment here. =) Fascinating, artistic, creepy. Strolling through a famous cemetery | Where to next?